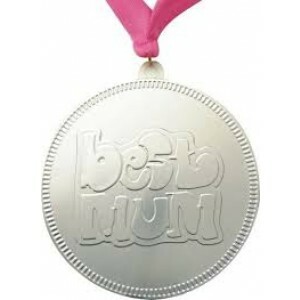 These milk chocolate medals are covered in silver foil and are embossed with the words 'Best Mum'. 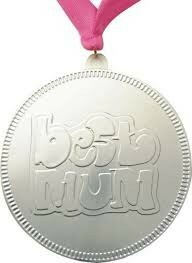 The chocolate medallion is attached with pretty pink ribbon so you decorate your Mum to be or New Mum with a medal, which she can then eat. Best before date of at least 6 months. Diameter 100mm and weight 75g.